"ASL" redirects here. For other uses, see ASL (disambiguation). "Canadian Sign Language" redirects here. For French Canadian Sign Language, see Quebec Sign Language. L2 users: Used as L2 by many hearing people and by Hawaii Sign Language speakers. Ontario only in domains of: legislation, education and judiciary proceedings. 40 US states recognize ASL to varying degrees, from a foreign language for school credits to the official language of that state's deaf population. Travis Dougherty explains and demonstrates the ASL alphabet. Voice-over interpretation by Gilbert G. Lensbower. I see, however, and I say it with regret, that any efforts that we have made or may still be making, to do better than, we have inadvertently fallen somewhat back of Abbé de l'Épée. Some of us have learned and still learn signs from uneducated pupils, instead of learning them from well instructed and experienced teachers. American Sign Language is growing in popularity among many states. Many people in high school and colleges desire to take it as a foreign language, but until recently, it was not a creditable foreign language elective. The issue was that many didn't consider it a foreign language. ASL users, however, have a very distinct culture and way they interact when talking. Their facial expressions and hand movements reflect what they are conveying. They also have their own sentence structure which sets the language apart. American sign language is now being accepted by many colleges as a foreign language credit; many states are making it mandatory to accept it. 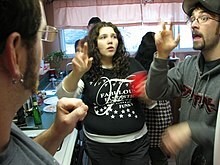 Prior to the birth of ASL, sign language had been used by various communities in the United States. :5 In the United States, as elsewhere in the world, hearing families with deaf children have historically employed ad-hoc home sign, which often reaches much higher levels of sophistication than gestures used by hearing people in spoken conversation. :5 As early as 1541 at first contact by Francisco Vásquez de Coronado, there were reports that the Plains Indians had developed a sign language to communicate between tribes of different languages. In the 19th century, a "triangle" of village sign languages developed in New England: one in Martha's Vineyard, Massachusetts; one in Henniker, New Hampshire, and one in Sandy River Valley, Maine. Martha's Vineyard Sign Language (MVSL), which was particularly important for the history of ASL, was used mainly in Chilmark, Massachusetts. :5–6 Due to intermarriage in the original community of English settlers of the 1690s, and the recessive nature of genetic deafness, Chilmark had a high 4% rate of genetic deafness.:5–6. MVSL was used even by hearing residents whenever a deaf person was present,:5–6 and also in some situations where spoken language would be ineffective or inappropriate, such as during church sermons or between boats at sea. ASL is thought to have originated in the American School for the Deaf (ASD), founded in Hartford, Connecticut in 1817.:4 Originally known as The American Asylum, At Hartford, For The Education And Instruction Of The Deaf And Dumb, the school was founded by the Yale graduate and divinity student Thomas Hopkins Gallaudet. Gallaudet, inspired by his success in demonstrating the learning abilities of a young deaf girl Alice Cogswell, traveled to Europe in order to learn deaf pedagogy from European institutions. Ultimately, Gallaudet chose to adopt the methods of the French Institut National de Jeunes Sourds de Paris, and convinced Laurent Clerc, an assistant to the school's founder Charles-Michel de l'Épée, to accompany him back to the United States. [nb 2] Upon his return, Gallaudet founded the ASD on April 15, 1817. Up to the 1950s, the predominant method in deaf education was oralism – acquiring oral language comprehension and production. Linguists did not consider sign language to be true "language", but rather something inferior. Recognition of the legitimacy of ASL was achieved by William Stokoe, a linguist who arrived at Gallaudet University in 1955 when this was still the dominant assumption. Aided by the civil rights movement of the 1960s, Stokoe argued for manualism, the use of sign language in deaf education. Stokoe noted that sign language shares the important features that oral languages have as a means of communication, and even devised a transcription system for ASL. In doing so, Stokoe revolutionized both deaf education and linguistics. In the 1960s, ASL was sometimes referred to as "Ameslan", but this term is now considered obsolete. In addition to the aforementioned West African countries, ASL is reported to be used as a first language in Barbados, Bolivia, Cambodia, the Central African Republic, Chad, China (Hong Kong), the Democratic Republic of the Congo, Gabon, Jamaica, Kenya, Madagascar, the Philippines, Singapore, and Zimbabwe. ASL is also used as a lingua franca throughout the deaf world, widely learned as a second language. Sign production can often vary according to location. Signers from the South tend to sign with more flow and ease. Native signers from New York have been reported as signing comparatively more quickly and sharply. Sign production of native Californian signers has also been reported as being fast as well. Research on this phenomenon often concludes this fast-paced production for signers from the coast could be due to the fast-paced nature of living in large metropolitan areas. This conclusion also supports how the ease with which Southern sign could be due to the easy going environment of the South in comparison to that of the East and West coast. Sign production can also vary depending on age and native language. For example, sign production of letters may vary in older signers. Slight differences in finger spelling production can be a signal of age. Additionally, signers who learned American Sign Language as a second language vary in production. 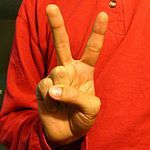 For Deaf signers who learned a different sign language before learning American Sign Language, qualities of their native language may show in their ASL production. Some examples of this varied production are finger spelling towards the body instead of away from, and signing certain movement from bottom to top instead of top to bottom. Hearing people that learn American Sign Language also have noticeable differences in signing production. 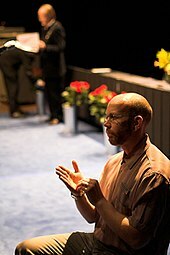 The most notable production difference of hearing people learning American Sign Language is their rhythm and arm posture. Most popularly there are variants of the signs for English words such as "birthday", "pizza", "Halloween", "early", and "soon". These are just a sample of the most commonly recognized signs with variant based on regional change. The sign for "school" is commonly varied between black and white signers. The variation between sign produced by black and white signers is sometimes referred to as Black American Sign Language. The prevalence of residential Deaf schools can account for much of the regional variance of signs and sign productions across the United States. Deaf schools often serve students of the state in which the school resides. This limited access to signers from other regions, combined with the residential quality of Deaf Schools promoted specific use of certain sign variants. Native signers did not have much access to signers from other regions during the beginning years of their education. It is hypothesized that because of this seclusion, certain variants of a sign prevailed over others due to the choice of variant used by the student of the school/signers in the community. However, American Sign Language does not appear to be vastly varied when compared to other signed languages. This is because when Deaf education was beginning in the United States, many educators flocked to the American School for the Deaf in Hartford, Connecticut. This central location for the first generation of educators in Deaf education to learn American Sign Language allows ASL to be more standardized than it is variant. Varieties of ASL are found throughout the world. There is little difficulty in comprehension among the varieties of the United States and Canada. Just as there are accents in speech, there are regional accents in sign. People from the South sign slower than people in the North—even people from northern and southern Indiana have different styles. —  Walker, Lou Ann (1987). A Loss for Words: The Story of Deafness in a Family. New York: HarperPerennial. p. 31. ISBN 978-0-06-091425-7. Mutual intelligibility among these ASL varieties is high, and the variation is primarily lexical. For example, there are three different words for English about in Canadian ASL; the standard way, and two regional variations (Atlantic and Ontario), as shown in the videos on the right. Variation may also be phonological, meaning that the same sign may be signed in a different way depending on the region. 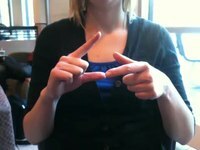 For example, an extremely common type of variation is between the handshapes /1/, /L/, and /5/ in signs with one handshape. When communicating with hearing English speakers, ASL-speakers often use what is commonly called Pidgin Signed English (PSE) or 'contact signing', a blend of English structure with ASL. Various types of PSE exist, ranging from highly English-influenced PSE (practically relexified English) to PSE which is quite close to ASL lexically and grammatically, but may alter some subtle features of ASL grammar. Fingerspelling may be used more often in PSE than it is normally used in ASL. There have been some constructed sign languages, known as Manually Coded English (MCE), which match English grammar exactly and simply replace spoken words with signs; these systems are not considered to be varieties of ASL. Tactile ASL (TASL) is a variety of ASL used throughout the United States by and with the deaf-blind. It is particularly common among those with Usher's syndrome. This syndrome results in deafness from birth followed by loss of vision later in life; consequently, those with Usher's syndrome often grow up in the Deaf community using ASL, and later transition to TASL. TASL differs from ASL in that signs are produced by touching the palms, and there are some grammatical differences from standard ASL in order to compensate for the lack of non-manual signing. In 2013 the White House published a response to a petition that gained over 37,000 signatures to officially recognize American Sign Language as a community language and a language of instruction in schools. The response is titled "there shouldn't be any stigma about American Sign Language" and addressed that ASL is a vital language for the Deaf and hard of hearing. Stigmas associated with sign languages and the use of sign for educating children often lead to the absence of sign during periods in children's lives when they can access languages most effectively. Scholars such as Beth S. Benedict advocate not only for bilingualism (using ASL and English training) but also for early childhood intervention for children who are deaf. York University psychologist Ellen Bialystok has also campaigned for bilingualism, arguing that those who are bilingual acquire cognitive skills that may help to prevent dementia later in life. Although there is no well-established writing system for ASL, written sign language dates back almost two centuries. 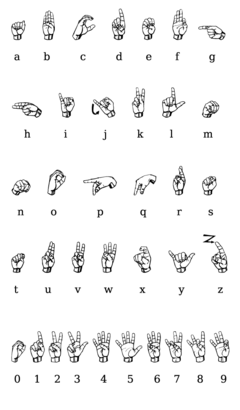 The first systematic writing system for a sign language seems to be that of Roch-Ambroise Auguste Bébian, developed in 1825.:153 However, written sign language remained marginal among the public. 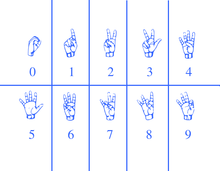 :154 In the 1960s, linguist William Stokoe created Stokoe notation specifically for ASL. It is alphabetic, with a letter or diacritic for every phonemic (distinctive) hand shape, orientation, motion, and position, though it lacks any representation of facial expression, and is better suited for individual words than for extended passages of text. Stokoe used this system for his 1965 A Dictionary of American Sign Language on Linguistic Principles. SignWriting, proposed in 1974 by Valerie Sutton,:154 is the first writing system to gain use among the public and the first writing system for sign languages to be included in the Unicode Standard. SignWriting consists of more than 5000 distinct iconic graphs/glyphs. :154 Currently, it is in use in many schools for the Deaf, particularly in Brazil, and has been used in International Sign forums with speakers and researchers in more than 40 countries, including Brazil, Ethiopia, France, Germany, Italy, Portugal, Saudi Arabia, Slovenia, Tunisia, and the United States. Sutton SignWriting has both a printed and an electronically produced form so that persons can use the system anywhere that oral languages are written (personal letters, newspapers, and media, academic research). The systematic examination of the International Sign Writing Alphabet (ISWA) as an equivalent usage structure to the International Phonetic Alphabet for spoken languages has been proposed. According to some researchers, SignWriting is not a phonemic orthography and does not have a one-to-one map from phonological forms to written forms. :163 This assertion has been disputed and the process for each country to look at the ISWA and create a phonemic/morphemic assignment of features of each sign language was proposed by researchers Msc. Roberto Cesar Reis da Costa and Madson Barreto in a thesis forum on June 23, 2014. The SignWriting community has an open project on Wikimedia Labs to support the various Wikimedia projects on Wikimedia Incubator and elsewhere involving SignWriting. The ASL Wikipedia request was marked as eligible in 2008 and the test ASL Wikipedia has 50 articles written in ASL using SignWriting. Comparison of ASL writing systems. Sutton SignWriting is on the left, followed by Si5s, then Stokoe notation in the center, with SignFont and its simplified derivation ASL-phabet on the right. Several additional candidates for written ASL have appeared over the years, including SignFont, ASL-phabet, and Si5s. For English-speaking audiences, ASL is often glossed using English words. These glosses are typically all-capitalized and are arranged in ASL order. For example, the ASL sentence DOG NOW CHASE>IX=3 CAT, meaning "the dog is chasing the cat", uses NOW to mark ASL progressive aspect and shows ASL verbal inflection for the third person (written with >IX=3). However, glossing is not used to write the language for speakers of ASL. The American manual alphabet and numbers. ASL possesses a set of 26 signs known as the American manual alphabet, which can be used to spell out words from the English language. These signs make use of the 19 handshapes of ASL. For example, the signs for 'p' and 'k' use the same handshape but different orientations. A common misconception is that ASL consists only of fingerspelling; although such a method (Rochester Method) has been used, it is not ASL. Fingerspelling is a form of borrowing, a linguistic process wherein words from one language are incorporated into another. In ASL, fingerspelling is used for proper nouns and for technical terms with no native ASL equivalent. There are also some other loan words which are fingerspelled, either very short English words or abbreviations of longer English words, e.g. O-N from English 'on', and A-P-T from English 'apartment'. Fingerspelling may also be used to emphasize a word that would normally be signed otherwise. "The father loves the child." Topicalization, accompanied with a null subject and a subject copy, can produce yet another word order, object–verb–subject (OVS). These properties of ASL allow it a variety of word orders, leading many to question which is the true, underlying, "basic" order. There are several other proposals that attempt to account for the flexibility of word order in ASL. One proposal is that languages like ASL are best described with a topic–comment structure, where words are ordered by their importance in the sentence rather than by their syntactic properties. Another hypothesis is that ASL exhibits free word order, in which syntax is not encoded in word order whatsoever, but can be encoded by other means (e.g. head nods, eyebrow movement, body position). A common misconception is that signs are iconically self-explanatory, that they are a transparent imitation of what they mean, or even that they are pantomime. In fact, many signs bear no resemblance to their referent, either because they were originally arbitrary symbols or because their iconicity has been obscured over time. Even so, in ASL iconicity plays a significant role; a high percentage of signs resemble their referents in some way. This may be due to the fact that the medium of sign—three-dimensional space—naturally allows more iconicity than oral language. In the era of the influential linguist Ferdinand de Saussure, it was assumed that the mapping between form and meaning in language must be completely arbitrary. Although onomatopoeia is a clear exception, since words like 'choo-choo' bear clear resemblance to the sounds that they mimic, the Saussurean approach was to treat these as marginal exceptions. ASL, with its significant inventory of iconic signs, directly challenges this theory. Research on acquisition of pronouns in ASL has shown that children do not always take advantage of the iconic properties of signs when interpreting their meaning. It has been found that when children acquire the pronoun "you", the iconicity of the point (at the child) is often confused, being treated more like a name. This is a similar finding to research in oral languages on pronoun acquisition. It has also been found that iconicity of signs does not affect immediate memory and recall; less iconic signs are remembered just as well as highly iconic signs. ^ In particular, Martha's Vineyard Sign Language, Henniker Sign Language, and Sandy River Valley Sign Language were brought to the school by students. These in turn appear to have been influenced by early British Sign Language, and did not involve input from indigenous Native American sign systems. See Padden (2010:11), Lane, Pillard & French (2000:17), and Johnson & Schembri (2007:68). Ruben, Robert J. (2005). "Sign language: Its history and contribution to the understanding of the biological nature of language". Acta Oto-laryngologica. 125 (5): 464–7. doi:10.1080/00016480510026287. PMID 16092534. Padden, Carol A. (2001). Folk Explanation in Language Survival in: Deaf World: A Historical Reader and Primary Sourcebook, Lois Bragg, Ed. New York: New York University Press. pp. 107–108. ISBN 978-0-8147-9853-9. ^ Whereas deafness was genetically recessive on Martha's Vineyard, it was dominant in Henniker. On the one hand, this dominance likely aided the development of sign language in Henniker since families would be more likely to have the critical mass of deaf people necessary for the propagation of signing. On the other hand, in Martha's Vineyard the deaf were more likely to have more hearing relatives, which may have fostered a sense of shared identity that led to more inter-group communication than in Henniker. See Lane, Pillard & French (2000:39). ^ Although some surveys of smaller scope measure ASL use, such as the California Department of Education recording ASL use in the home when children begin school, ASL use in the general American population has not been directly measured. See Mitchell et al. (2006:1). ^ Stokoe himself termed these cheremes, but other linguists have referred to them as phonemes. See Bahan (1996:11). ^ Province of Ontario (2007). "Bill 213: An Act to recognize sign language as an official language in Ontario". ^ Laurent Clerc National Deaf Education Center. "States that Recognize American Sign Language as a Foreign Language" (PDF). Archived from the original (PDF) on 12 April 2015. Retrieved 23 July 2015. ^ Hammarström, Harald; Forkel, Robert; Haspelmath, Martin, eds. (2017). "ASLic". Glottolog 3.0. Jena, Germany: Max Planck Institute for the Science of Human History. ^ Hammarström, Harald; Forkel, Robert; Haspelmath, Martin, eds. (2017). "American Sign Language". Glottolog 3.0. Jena, Germany: Max Planck Institute for the Science of Human History. ^ "ASL as a Foreign Language Fact Sheet". www.unm.edu. Retrieved 2015-11-04. ^ Wilcox Phd, Sherman (May 2016). "Universities That Accept ASL In Fulfillment Of Foreign Language Requirements". Retrieved May 24, 2018. ^ Burke, Sheila (April 26, 2017). "Bill Passes Requiring Sign Language Students Receive Credit". US News. Archived from the original on 2017-10-11. Retrieved May 24, 2018. ^ Ceil Lucas, 1995, The Sociolinguistics of the Deaf Community p. 80. ^ Groce, Nora Ellen (1985). Everyone Here Spoke Sign Language: Hereditary Deafness on Martha's Vineyard. Cambridge, MA: Harvard University Press. ISBN 978-0-674-27041-1. Retrieved 21 October 2010. ^ a b c d "A Brief History of ASD". American School for the Deaf. n.d. Retrieved November 25, 2012. ^ "A Brief History Of The American Asylum, At Hartford, For The Education And Instruction Of The Deaf And Dumb". 1893. Retrieved November 25, 2012. ^ Stokoe, William C. 1960. Sign Language Structure: An Outline of the Visual Communication Systems of the American Deaf, Studies in linguistics: Occasional papers (No. 8). Buffalo: Dept. of Anthropology and Linguistics, University of Buffalo. ^ "American Sign Language, ASL or Ameslan". Handspeak.com. Retrieved 2012-05-21. ^ Benoit Duchateau-Arminjon, 2013, Healing Cambodia One Child at a Time, p. 180. ^ Rogelio, Contreras (November 15, 2002). "Regional, Cultural, and Sociolinguistic Variation of ASL in the United States". ^ a b c d e f Valli, Clayton (2005). Linguistics of American Sign Language: An Introduction. Washington, D.C.: Clerc Books. p. 169. ISBN 978-1-56368-283-4. ^ a b c Nakamura, Karen (2008). "About ASL". Deaf Resource Library. Retrieved December 3, 2012. ^ Newman, Aaron J.; Bavelier, Daphne; Corina, David; Jezzard, Peter; Neville, Helen J. (2002). "A critical period for right hemisphere recruitment in American Sign Language processing". Nature Neuroscience. 5 (1): 76–80. doi:10.1038/nn775. PMID 11753419. ^ Denworth, Ldyia (2014). I Can Hear You Whisper: An Intimate Journey through the Science of Sound and Language. USA: Penguin Group. p. 293. ISBN 978-0-525-95379-1. ^ Armstrong, David F., and Michael A. Karchmer. "William C. Stokoe and the Study of Signed Languages." Sign Language Studies 9.4 (2009): 389-397. Academic Search Premier. Web. 7 June 2012. ^ Everson, Michael; Slevinski, Stephen; Sutton, Valerie. "Proposal for encoding Sutton SignWriting in the UCS" (PDF). Retrieved 1 April 2013. ^ "SignWriting Symposium Presentation 32 by Roberto Costa and Madson Barreto". signwriting.org. ^ "Test wikis of sign languages". incubator.wikimedia.org. ^ "Request for ASL Wikipedia". en.turkcewiki.org. ^ Baker, Anne; van den Bogaerde, Beppie; Pfau, Roland; Schermer, Trude (2016). The Linguistics of Sign Languages : An Introduction. John Benjamins Publishing Company. ISBN 9789027212306. ^ a b Neidle, Carol (2000). The Syntax of American Sign Language: Functional Categories and Hierarchical Structures. Cambridge, MA: The MIT Press. p. 59. ISBN 978-0-262-14067-6. ^ Valli, Clayton (2005). Linguistics of American Sign Language: An Introduction. Washington, D.C.: Clerc Books. p. 85. ISBN 978-1-56368-283-4. ^ a b c d e Valli, Clayton (2005). Linguistics of American Sign Language: An Introduction. Washington, D.C.: Clerc Books. p. 86. ISBN 978-1-56368-283-4. ^ Lillo-Martin, Diane (November 1986). "Two Kinds of Null Arguments in American Sign Language" (PDF). Natural Language and Linguistic Theory. 4 (4): 415. doi:10.1007/bf00134469. Retrieved 20 April 2013. ^ Petitto, Laura A. (1987). "On the autonomy of language and gesture: Evidence from the acquisition of personal pronouns in American sign language". Cognition. 27 (1): 1–52. doi:10.1016/0010-0277(87)90034-5. PMID 3691016. Bahan, Benjamin (1996). Non-Manual Realization of Agreement in American Sign Language (PDF). Boston University. Retrieved November 25, 2012. Bailey, Carol; Dolby, Kathy (2002). The Canadian dictionary of ASL. Edmonton, AB: The University of Alberta Press. ISBN 978-0888643001. Bishop, Michele; Hicks, Sherry (2005). "Orange Eyes: Bimodal Bilingualism in Hearing Adults from Deaf Families" (PDF). Sign Language Studies. 5 (2): 188–230. doi:10.1353/sls.2005.0001. Retrieved December 3, 2012. Collins, Steven (2004). Adverbial Morphemes in Tactile American Sign Language. Union Institute & University. Costello, Elaine (2008). American Sign Language Dictionary. Random House. ISBN 978-0375426162. Retrieved November 26, 2012. Johnson, Trevor; Schembri, Adam (2007). 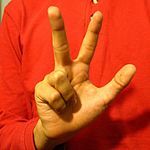 Australian Sign Language (Auslan): An introduction to sign language linguistics. Cambridge University Press. ISBN 978-0521540568. Retrieved November 27, 2012. Kegl, Judy (2008). "The Case of Signed Languages in the Context of Pidgin and Creole Studies". In Kouwenberg, Silvia; Singler, John (eds.). The Handbook of Pidgin and Creole Studies. Blackwell Publishing. ISBN 978-0521540568. Retrieved November 27, 2012. Klima, Edward S.; Bellugi, Ursula (1979). The signs of language. Boston: Harvard University Press. ISBN 978-0-674-80796-9. Lane, Harlan; Pillard, Richard; French, Mary (2000). "Origins of the American Deaf-World" (PDF). Sign Language Studies. 1 (1): 17–44. doi:10.1353/sls.2000.0003. Retrieved November 25, 2012. Lucas, Ceil; Bayley, Robert; Valli, Clayton (2003). What's your sign for pizza? : An introduction to variation in American Sign Language. Washington, DC: Gallaudet University Press. ISBN 978-1563681448. Mitchell, Ross; Young, Travas; Bachleda, Bellamie; Karchmer, Michael (2006). "How Many People Use ASL in the United States? : Why Estimates Need Updating" (PDF). Sign Language Studies. 6 (3). ISSN 0302-1475. Retrieved November 27, 2012. Solomon, Andrea (2010). Cultural and Sociolinguistic Features of the Black Deaf Community (Honors Thesis). Carnegie Mellon University. Retrieved December 4, 2012. Supalla, Samuel; Cripps, Jody (2011). "Toward Universal Design in Reading Instruction" (PDF). Bilingual Basics. 12 (2). Retrieved January 5, 2012. Valli, Clayton; Lucas, Ceil (2000). Linguistics of American Sign Language. Gallaudet University Press. ISBN 978-1-56368-097-7. Retrieved December 2, 2012.